Callister and Co.: Choose the Right. Aubree received this tiny, precious ring from her Grandma when she was born. It's been sitting in her dresser ever since. We accidentally came across it again the other day (some how it found itself in the kitchen sink??) And realized that it now fits. She LOVES it and feels so special to wear it. 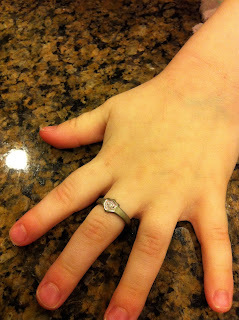 Now it just need to polish it up after sitting in water for hours...And how cute is it on her tiny chubby hand? Seriously. How fun! I remember my first CTR ring. I got it when I was old enough to be in the CTR class at church. Now, all the classes are CTR classes, so I'm not sure if they give rings out after nursery. Is her ring an actual ring? Does that make sense? The one I received from church was one of the adjustable rings they give to kids.